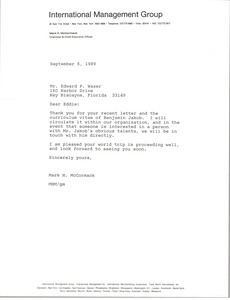 Mr. Agnew would like to talk to McCormack to discuss a project with the Sinatra's. Japan - Concerning the attached article from the Japan Times entitled "Leisure investment booming" about the sale of hotels and resorts in the real estate business. 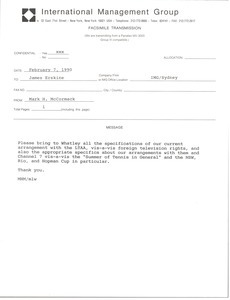 Enclosure not scanned. 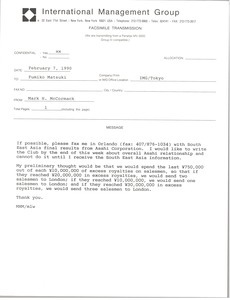 Concerning the attached memorandum regarding Tom Baird, who would like to do a phone interview with McCormack. 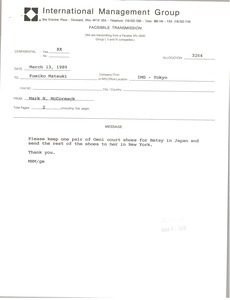 McCormack asks for the Southeast Asia final results from the Asahi Corporation, so that McCormack can report on the Asahi relationship to the All England Club. 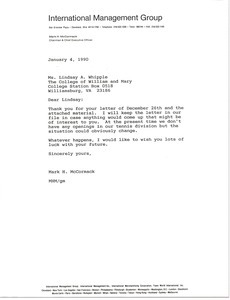 McCormack thanks Whipple for her letter and resume, and informs her that he will keep her material on file in case anything comes up that may be of interest to her. 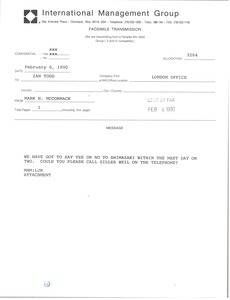 Concerning negotiations regarding a morale agreement with Mrs. Ichibachi. 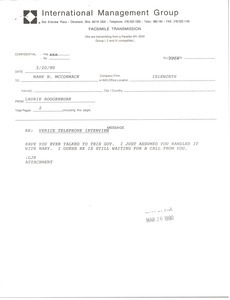 Attached is an earlier draft of this fax. 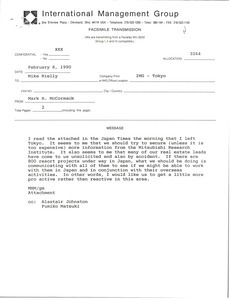 Concerning saying yes or no to Shimazaki within the next day or two, McCormack asks Todd to call Gilles Weil. 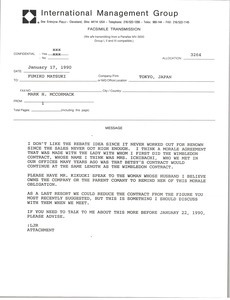 McCormack thanks Waxer for forwarding the CV of Benjamin Jakob. 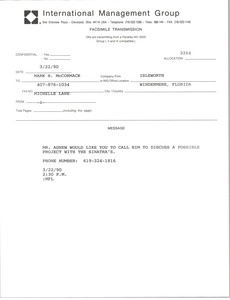 McCormack asks Erskine to bring to Whatley all the specifications of IMG's current arrangement with the LTAA.